Authorize the release of your credit history at a bank with the help of this handy form. Ideal for employment and lending purposes. 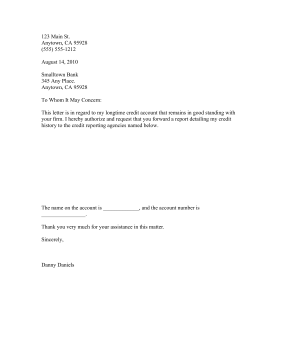 This letter is in regard to my longtime credit account that remains in good standing with your firm. I hereby authorize and request that you forward a report detailing my credit history to the credit reporting agencies named below. The name on the account is _____________, and the account number is ________________.